Many survivors saw water on deck 1 before 01.00 hrs (33) after the bangs but before the sudden listing and that the watertight doors were open. Deck 1 forward consists of six watertight compartments with passenger cabins without private facilities. The watertight bulkheads are about 10 meters apart. Every bulkhead has one (illegal) watertight door. The public toilets are in the second and fifth compartment, i.e. 75% of all passengers on deck 1 must pass a watertight door to visit the toilet. It is clear 1.23) that these doors were always open in contradiction to SOLAS II-1, reg. 15.7.1.2.3 and reg. 15.9.2, but maybe the exemption regulation 15.9.3 had been applied earlier for protected coastal trading. It is very possible that sea water flowed into the ship on deck 0 four meters below the water line, e.g. between frames nos. 85-98 and/or 98-110, i.e. the pool and the conference/sewage tank rooms, long before 01.00 hrs. The pool area was a rust trap, impossible to inspect the hull plates behind linings and decorations and and it is possible that the rusty bilge plate fractured and was pushed in, etc. But deck 0 is three meters below deck 1. If a compartment on deck 0 were flooded, the water would naturally rise up to deck 1 through the stairwell and then spill out on deck 1 centre corridor. Actually the water would spill out before due to rolling and then flow to the starboard side due to the list. The pool compartment had a volume of about 750 m3. The conference compartment was slightly smaller. It may have taken 5-10 minutes to fill up these compartments to deck 1 level, longer, if the bilge pumps were running full blast. If compartments on deck 0 forward were flooded, the ship would start to trim on the bow. The little water that leaked in on the car deck at the bow ramp 2.19 would then collect inside the ramp. It could not flow aft. The Commission has made great efforts to produce evidence that the passengers on deck 1 saw water flowing down the stairwell from the car deck (deck 2). Any water on the car deck must then pass over a 25 cms sill and through a closed fire door at the centre line of the ship. If the ship was still upright, you need plenty of water on the car deck to reach the sill - the water would collect forward, behind the ramp, and increase the bow trim. The water level would be 1-2 metres deep at the bow to be 25 cms deep at the first fire door! 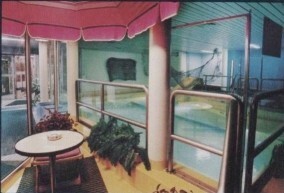 But any water on the car deck would heel the ship and the doors at the centre line would be far away from any water. Very little water was in fact seen on deck 1. It must have come from below. Before the passengers on deck 1 noted some big bangs - maybe the water on deck 0 spread quickly, so the water on deck 1 flowed back again to deck 0 into several compartments - and the sudden list occurred due to free water surfaces on deck 0. The loss of stability was described in 2.17.